Displaying a guild emblem for multiplayer interactions. The ability to move the alternative health bar to wherever you’d like on the screen. Most of the characters on the show had it placed in the upper left corner of their Heads Up Display. Removing the default Minecraft health bar in order to simply go off of the alternative HUD this mod establishes. 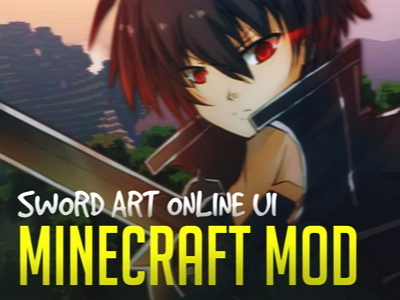 Since Minecraft is already a game within a virtual world that encourages exploration and experimentation, it makes sense that someone would eventually look into crossing over a virtual property like Sword Art Online. Whether you’re a fan of that particular series or you’re just getting bored with looking at the same health bar every time you play Minecraft, considering giving this mod a shot.